I have a BA from the University of Sydney in history, French and Japanese and an MA in Applied Linguistics from the University of New England, Australia. I’ve taught English as a foreign or additional language from tertiary to kindergarten level in Australia, France, Japan, Argentina and China. 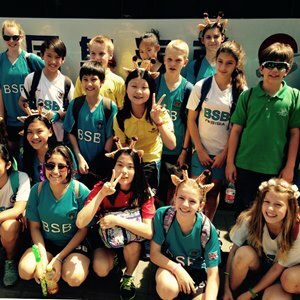 Working at BSB gives me a great opportunity to pull together all my previous experience with different levels, different ages and different nationalities – all in the one position. The level of challenge and reward that comes from working at BSB would be hard to find in any other single job. I earned a certificate in Child and Youth Work and started my career in Toronto, in child and adolescent mental health in 2004. I worked in various settings, providing support to children with mild to intense emotional and behavioural needs. Later I complete a Bachelor of Arts from the University of Ottawa, with a focus in English and Geography. In 2011, I travelled to Taiwan, where I worked for 3 years as a kindergarten teacher in an international school. After completing CELTA certification in 2014 and I moved to Saudi Arabia for just over two years where I taught both 2nd and 3rd grade. This past summer I complete a degree in English as a Second Language from The College of New Jersey, and I will return next summer to complete a Masters in Education. In 2009, I graduated from Swansea University with a Masters in Ancient Egyptian Civilisation. From 2006-2011, I also worked in museum education delivering activities to visiting school groups and working with young volunteers as part of the Children’s and Youth University. In 2012, I moved to China to work as a teaching assistant at the British School of Shunyi, and Sanlitun. I really enjoyed my experience of working in schools, specifically working with EAL children. In 2015, I completed my CELTA at Sheffield University and became a Grade 1 English teacher at an International Bilingual School in Beijing. I am currently completing my Masters in Applied Linguistics and TESOL through the University of Leicester. I have a Bachelor degree in English literature from Beijing Language and Culture University and a CELTA certification. Before I joined in BSB, I worked for Beijing Youth Politics College Telfort Business Institute as an English teacher for four years and a half.